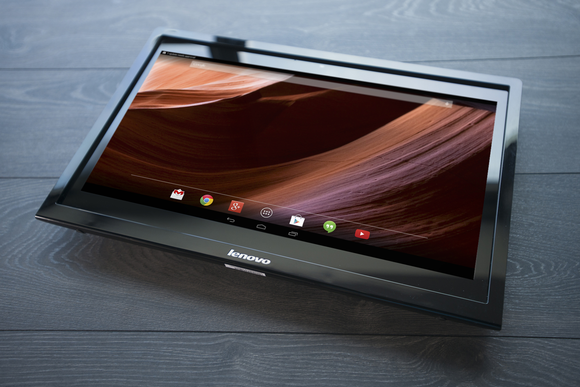 Lenovo’s N308 All-in-One is the most offbeat member of this oddball trio. Its $350 price tag is even more attractive than HP’s Slate 21 Pro ($379), but unlike that machine and Acer’s pricey TA272HUL ($1099), the N308 can also function as a battery-powered tablet. Many of its remaining specs, however, are not as compelling as those of either of its competitors. The display is the biggest letdown. Where the HP has a 21-inch screen with resolution of 1920x1080 pixels and the Acer has a 27-inch monitor with resolution of 2560x1440 pixels, Lenovo delivers a 19.5-inch screen with resolution of just 1600x900 pixels. And where its competitors step up by using IPS panels, Lenovo cheaps out with an inferior TN panel. The Lenovo N380 can switch from a 10-pound all-in-one to a 10-pound tablet. Viewing photos and videos on this machine was a distinctly inferior experience. Its infrared two-point touch technology is a step ahead of HP’s camera-based two-point touch, but far behind Acer’s 10-point capacitive touch. As with its competitors, Lenovo chose Nvidia’s Tegra 4 T40S processor to power the N308, aided by 2GB of DDR3/1600 memory and 8GB of flash storage. In a surprise move, Lenovo also packs a 320GB mechanical hard drive behind the glass. I know what you’re thinking: “A mechanical hard drive? In a tablet?” They’ve worked in notebooks for years, so they should be fine in tablets. Still, I’d love to see Lenovo’s warranty claims in a year’s time. Lenovo's N308 trailed the pack in our benchmarks, but not by much. Lenovo provides a basic wireless mouse and keyboard with the N308, but unlike the HP and Acer machines, it can’t be used as a touchscreen display for a notebook or desktop PC. The all-in-one has two USB 2.0 ports, a 6-in-1 card reader, mic and headphone jacks, and a 10/100 LAN port. The appeal of using the N308 as a big tablet is tempered by its 10-plus-pound bulk and the fact that its battery petered out after just 2 hours and 37 minutes in our battery run-down test. That’s long enough to watch one movie and do some IMDb searches afterward before needing to plug it back in. 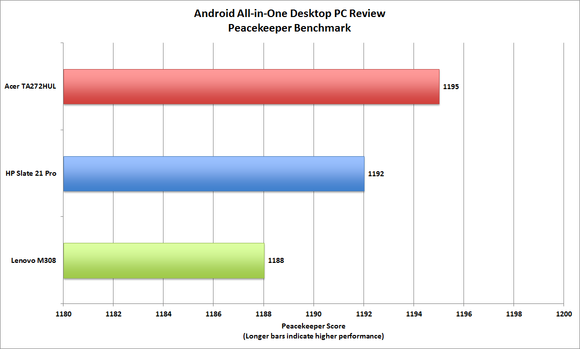 This isn’t the perfect all-in-one, but its low price tag and its ability to tap into the Android universe of free, high-quality, cloud-based apps gives it a very good price-to-performance ratio. 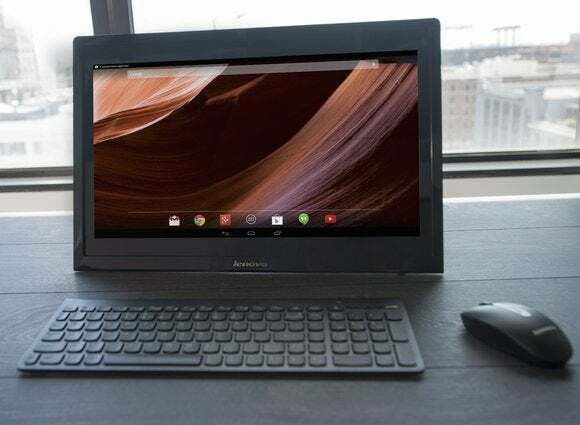 Lenovo is mostly successful in its effort to blend a smallish all-in-one PC with a large Android tablet. The best news is that the experiment doesn't cost a lot.